Deep Sea Mooring has taken receipt of a first batch of RigLOK connectors, designed and manufactured by Balltec in the UK and certified by DNV-GL. The RigLOK connectors are designed for hydro acoustic quick release of mooring lines, either in the event of iceberg or weather evasion, or to reduce anchor handling time during rig moves and as such save significant rig and vessel costs. 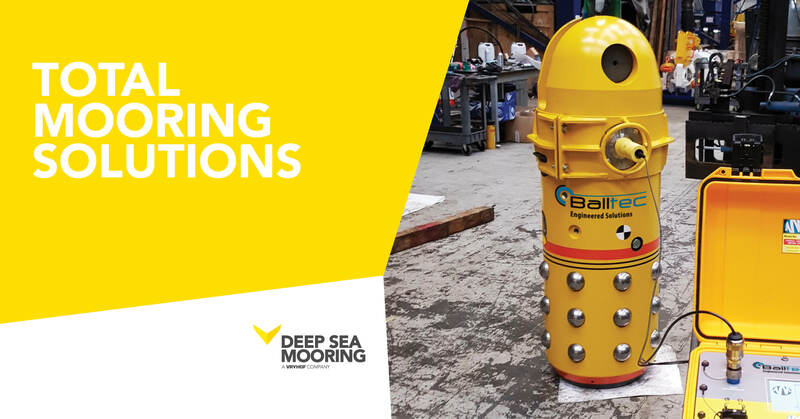 The connectors are now ready for service, a result of over 2 years of combined R&D utilising Balltec’s expertise in subsea mooring connections and Deep Sea Mooring’s extensive mooring know-how. The RigLOK connectors have undergone extensive factory acceptance testing and a series of sea trials to prove the effectiveness of the release-under-load mechanism and the acoustic trigger system. Each completed RigLOK unit has been proof load tested and rigorously function tested, and a single unit has been used to perform a full test to MBL +40% of 84mm R5 chain MBL, and a series of release under load tests. RigLOK follows the same, proven production processes and the exacting standards of the FPSO industry as applied for the Balltec’s MoorLOK connector, which has a proven track record with more than 300 connectors delivered in the permanent market for dis-connectable mooring connectors. The acoustic system has been developed by Applied Acoustics specifically for the RigLOK connector, and is a derivative of their acoustics protocols which in addition to offshore applications is also used in in military grade products that form part of the standard operating procedure for many NATO member Navies. In these cases, acoustic tracking systems are used to guide underwater vehicles towards potential mines, with the aim of identifying and/or destroying the threat. As these vehicles are loaded with high explosive charges, it is absolutely critical that the acoustic systems perform accurately, reliably and repeatedly in order to safely dispose of the target and to ensure the safety of the operating vessel and its crew. The acoustic system has achieved independent approval from DNV-GL for use in the RigLOK system. This manual is an extensive and very complete means of reference for all who purchase, use, maintain, repair or are in any way involved with anchoring. Download it here.